It is never too late to try something new. Horse riding is one of the most pleasing activities both in terms of physical and mental recreation. A recent equestrianism study revealed that there are more than 9 million horses in the US alone, while over 7 million persons take part in horseback riding every year. These figures prove the popularity of the sport and leave a lot of people in their post-20s wonder: Is it too late for me to learn horse riding? In this post, we will show you the answer to this question and explain how to prepare for the horseback riding adventure. Equestrianism is the real sports discipline and it’s completely reasonable to doubt your learning capacity now that you are in your 30s, 40s, or even older. However, horse riding is not karate and you don’t need to be afraid of giving it a try. All it takes is a little bit of preparation and strategic thinking. If you dedicate enough time to equestrianism, the outcome will be highly rewarding. To make the process easier for you, we prepared a list of the 5 most important tips for horse riding trainees in their post-20s. Let’s check it out here! Just like any other sport, horseback riding also demands a certain level of physical condition. If you don’t want to end up completely exhausted after day one of your equestrian undertaking, you should start training regardless of the age. It doesn’t have to be a strong or top-level exercise. Start slowly by taking a quicker and longer daily walks or do a little jogging. Tony Vartouhi, fitness specialist at the Essays.ScholarAdvisor, suggests that you ought to increase efforts and do some sport-specific exercises as the first couple of weeks go by. First of all, you have to improve your hip and leg strength because that’s what every horse rider needs the most. Things like stairs training, leg stretching, and rubber ball squeezing will help you improve balance and coordination. At the same time, they increase the inner thigh muscles and enhance your ability to hang on to your horse with your thighs. Secondly, you should develop core strength by doing sit-ups, exercising yoga poses, and practicing good posture. And thirdly, don’t forget to nurture the overall body condition by jogging a few times a week. Although this may sound like a little bit too much of training for your age, it’s actually not so difficult. These types of exercises don’t require more than 45 minutes a day and they will do miracles for your horseback riding fitness. And even if you are having second thoughts about equestrianism, you shouldn’t give up training because it’s perfect for your health in general. Sports gear has entered the new age of modernity and productivity, so now you can buy all sorts of stuff to improve personal performance. However, horse riding still relies on good old equipment such as saddles and stirrups. Helmet: Horseback riding can be dangerous, which is why you must wear a reliable and certified helmet when mounted. Shirts and jackets: What you choose depends on your own style and the outside temperature. Pants and breeches: Jeans and breeches are the usual suspects here, but it’s up to you to pick a concrete model. Chaps and chinks: These can give you a stronger grip and keep your legs dry. Boots: The options are countless and you need to see what suits you best. Do the research and see the ratings of nearby equestrianism schools. You can check out online reviews and ask around to find a good instructor who can teach you the horse riding basics quickly. It’s important to find an experienced person who can easily recognize your advantages and shortcomings. Besides that, the best instructors are always good psychologists. They understand what it’s like to begin training in your post-20s and know how to adapt lessons so as to fit your age. Such instructors will push you to the limit without jeopardizing safety. A reliable tutor will analyze your physical condition and find you a horse that you will be able to handle. You can also check out a few video tutorials to learn more about equestrianism before applying – it will make the job easier both for you and your instructor. 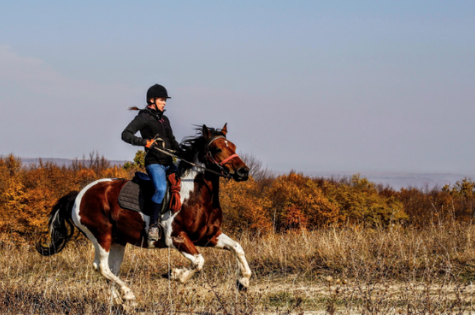 No matter how fit and well-prepared you may enter the horse riding course, keep in mind that you will probably experience muscle strain and other smaller injuries. We already mentioned the inner thigh muscles, but there are other muscle groups that also activate more than usual during horseback riding. In such circumstances, it is completely natural to feel under the weather for a few days until you get used to the new type of physical activity. Most riders also feel knee pain, back issues, and similar beginner-level problems. And there is another important thing to mention here – everybody falls off the horse sooner or later. To prevent this while you are still a rookie, you need to ride with awareness and avoid losing control over your horse. Instructors will teach you a lot of important details, but there are some things you just need to figure out on your own. For instance, horses can always sense your emotions. If you are afraid, they will rarely ever jump over the hurdle with you. If something goes wrong, it is almost always your mistake so don’t blame the horse. Try to learn from it instead and improve your riding capabilities. Keep your eyes open wide and you will catch a myriad of details that can help you become a great horse rider. Equestrianism is a special kind of sports that requires thorough preparations and full focus. However, it doesn’t mean you can’t learn it as an adult. On the contrary, people in their post-20s can figure it out easily if they follow expert recommendations.